For the historic site, see Prairie Grove Battlefield State Park. Map of Prairie Grove Battlefield core and study areas by the American Battlefield Protection Program. At dawn on December 7 Hindman began to doubt his initial plan to move on Cane Hill and instead continued north on Cove Creek Road with Marmaduke's men in the front. Why Hindman changed his mind is not known, but it is believed that he began to doubt his initial strategy. Little did Hindman realize, though, that this move would prove useful and allow his cavalry to strike an early deadly blow to the 7th Missouri and the 1st Arkansas. Meanwhile, Herron's divisions had performed a forced march to come to Blunt's rescue and met Marmaduke's probing cavalry south of Fayetteville, Arkansas. The battle opened on the morning of December 7 with Union general Herron crossing the river and deploying his footsore troops on Hindman's right. Herron opened an intense two-hour artillery barrage on the Confederate position, singling out individual Confederate cannon and concentrating on taking them out of action one at a time. By noon, the devastating barrage had disabled most of the Confederate artillery and forced many of the Confederate troops to shelter on the reverse slopes. As the surviving Federals rolled back down the hill toward the safety of Union lines, Confederate soldiers spontaneously pursued and attempt to break Herron's lines. Herron's artillery, loaded with canister, caused terrible damage to the unorganized Confederates and repulsed their attack. Meanwhile, Blunt realized that Hindman had gotten past his flank and intercepted Herron. Furious, he ordered his men to march to the sound of the guns. Not knowing the precise location of the fighting, the Federal troops ignored roads and traversed through farm fields and over fences straight toward the sound of battle at the double quick. This movement was probably initiated by Col. Thomas Ewing and the 11th Kansas Infantry. While Blunt did not order the maneuver he quickly endorsed it, even chastising a regimental commander for not showing enough initiative when he failed to follow the unorthodox procedure. Blunt's forces arrived on the field just as Hindman was ordering another attack on Herron's forces. Blunt's division slammed into the surprised Confederates and drove them back onto the hill. During this attack, the heaviest casualties of the battle were felt by the 10th Missouri Confederate Infantry, which was caught in the open, at the flank of the Confederate forces. 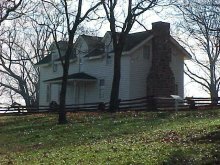 Blunt aligned his two brigades and sent them forward toward the Morton house on the same ridge to the west of the Borden house. Blunt's forces fought somewhat sporadically until being recalled off the ridge. Brig. Gen. Mosby M. Parsons' Confederate brigade swept across the farm fields of prairie toward Blunt's artillery. Once again the Union soldiers and artillery repulsed the attack and darkness put an end to the fighting. Prairie Grove Battlefield State Park is nationally known as one of the most intact Civil War battlefields. Active efforts are underway to acquire additional land for the park and preserve its integrity. The park is located just outside Prairie Grove, Arkansas, about 10 miles west of Fayetteville, Arkansas. The Prairie Grove order of battle has been compiled by the historians at the park. The Civil War Trust, a division of the American Battlefield Trust, and its partners have acquired and preserved 350 acres of the battlefield, including 270 acres of the 707-acre battlefield park. ^ a b "Battle Summary". National Park Service. Retrieved December 7, 2016.